The Snowbirds fly in diamond formation over the shoreline of Lake Huron, much to the delight of a crowd gathered on the beach in Goderich. 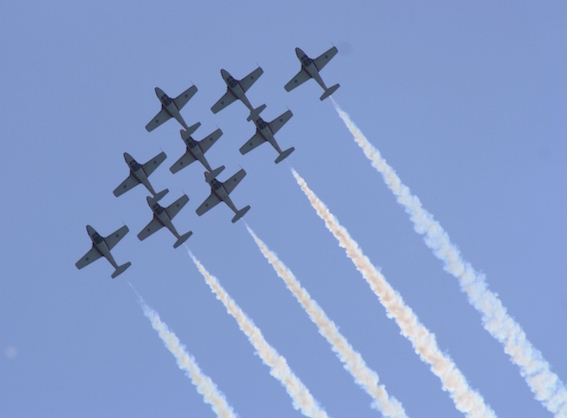 GODERICH – We couldn’t have asked for a more beautiful day for the Goderich and Region Air Show. It was warm and sunny, and the spectators were lined up all the way down the entire beachfront; some on benches, some on their lawn chairs, and even a few in the water! The SkyHawks, with their trademark Canadian flag parachutes, make their way to a landing at Goderich’s beach. First up were the Canadian Armed Forces SkyHawks. They are Canada’s only military parachute demonstration team. 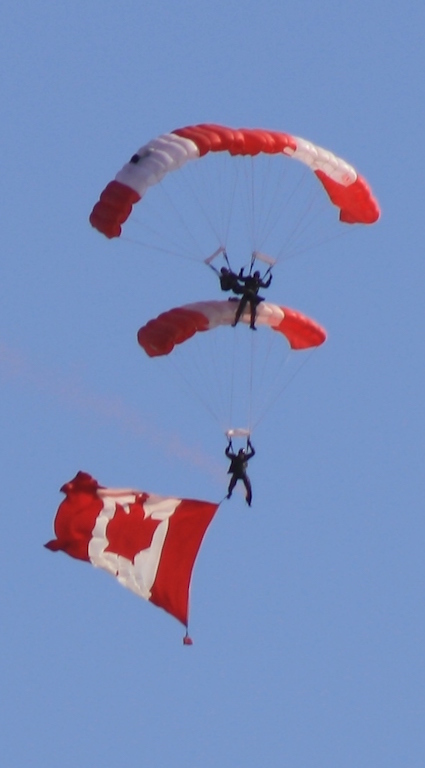 The SkyHawks have represented Canada for over 40 years with their signature Canadian flag parachutes. It was amazing to see how they got so close to each other and then hooked themselves together to make formations. They flew the Canadian and Ontario flags behind them and also used smoke during their descent. 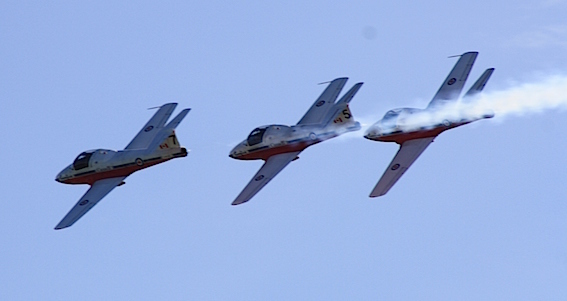 The Snowbirds fly in tight formation over Lake Huron’s shoreline. when they passed by while coming out or going into a manoeuvre. We also learned that there was a pilot who had flown over his hometown while he was here. Captain Bart Postma is originally from Clinton and flies Aircraft Number Three in the inner left-wing position. Unfortunately I was unable to stay to see the RCAF CF-18 Hornet demonstration. It was piloted by Captain Denis Cheech Beaulieu and tops out at Mach 1.8, which is 1,800km/hr. As I was leaving Goderich I could hear it all the way out to Highway 8 and see some of the locals looking and pointing to the sky. The CF-18 is known for its sheer power and its loud jet engine. It can accelerate vertically after take-off and the interesting part is that you won’t actually hear the jet until it’s past you because of the speeds it travels. After seeing this demonstration at another air show, I’m sure it didn’t disappoint the crowd. The air show has been called an “Overwhelming Success” by the 532 Maitland Royal Canadian Air Cadet Squadron, which organized the event. Perhaps this will be an annual event! For more information on events along Ontario’s West Coast, click here. Clusters of people lined the beach and the bluffs at Goderich, getting good seats from which to watch the air show.